The NetLink Internet Modem (or Net Link Internet Modem) is a device used to utilise with the NetLink internet service offered by Sega of America for Sega Saturn consumers in North America. NetLink had several purposes, including basic internet access, email and online gaming - a precursor to similar attempts for the Sega Dreamcast, and the many online features video game consoles have today. NetLink was exclusive to North America, though a small, unsuccessful test-run of the service occurred in Finland for a short period. In Japan there was the Sega Saturn Modem, an older (and slower) device which utilised different online services. The NetLink service can cause confusion, as it requires both a modem and compatible disc software in order to function. 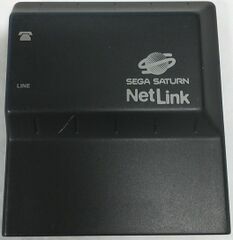 The NetLink Internet Modem needs to be placed in the Saturn's cartridge slot and hooked to a phone line (similar to the earlier Sega Mega Drive XB∀ND service), but in order to be utilised, a NetLink Custom Web Browser disc (or a compatible game disc) needs to be placed in the console. This is similar to the online services of the Sega Dreamcast, however the major difference there is that the Dreamcast Modem was included with the system. NetLink Internet Modems were sold in two forms, in a package (catalogue number 80118) containing just the modem and a NetLink Custom Web Browser disc, and alongside Model 2 Sega Saturn consoles (catalogue number 80121). Depending on the retailer, the extra NetLink Game Pack may have been thrown in as an added bonus. Also available as part of the NetLink "range" was the NetLink Mouse, NetLink Keyboard and NetLink Keyboard Adapter. The NetLink Internet Modem is a black 28.8kbps modem, slightly below upper-end home computers with 33.6kbps connections. The Netlink will still work in the modern age if you still have a analog phone line. Connecting the Sega Saturn NetLink modem is very simple. Make sure that your Sega Saturn game system is correctly attached to your TV and is working properly (consult your Sega Saturn Owners Manual for help). Then locate the phone outlet closest to your Sega Saturn. Check to make sure that the nearest phone outlet to your Sega Saturn has a dial tone. Make sure your Sega Saturn is off. Plug your NetLink modem into the cartridge slot of your Sega Saturn, making sure that the Sega Saturn logo on the NetLink modem is facing the front of the Saturn. Make sure that the NetLink modem fits snugly into the slot (gently wiggle it left to right slightly to make sure that it sits firmly in the cartridge slot). Connect one end of the included 10-meter (approximately 33 feet) phone cord to the bottom jack in the NetLink modem (labeled "Line"). Connect the other end of the included 10-meter phone cord to the nearest phone outlet with a dial tone. You may have to disconnect your phone; if so, you can plug it into the available jack on the Net Link modem (labeled with a picture of a phone). You will still be able to use the phone normally when you are not using your NetLink modem. Be careful to place the Net Link phone cord so nobody will trip over it. Place the NetLink web browser Compact Disc software in your Sega Saturn, label side up, and close the CD door. Turn the power to your Sega Saturn On. You can leave the NetLink modem attached while you're using normal Sega Saturn games; the games will not damage the NetLink, and the modem will not affect the games. However, you won't be able to use a Sega Saturn Backup RAM cartridge unless you remove the NetLink modem. Though heavily advertised, the NetLink service is seen as a failure in North America, mostly due to its high price point and lack of games that supported it. At the end of the console's run, less than five million people had purchased a Sega Saturn console, with significantly less having a Sega NetLink modem as well. Originally the unit was priced at $400 USD when bundled with the console, $199 by itself. While the NetLink was not the first piece of hardware to allow American gamers to get online (or at least play against others online/direct dial*), it was the first to allow players to use their own internet service provider (ISP). While Sega recommended Concentric as the ISP of choice (similar to the Sega Dreamcast when released in this region), they allowed for any ISP that met their technical specifications. Sega's target for North America was 100,000 NetLinks, however records show that only 15,000-25,000 were actually sold. Only five games supported the peripheral in this region, and all debuted much later than the modem itself, arriving in the latter half of 1997. A European release was on the cards for years, though outside of test runs in Finland, never materialised due to the state of Europe's network infrastructure at the time. Sega finally pulled the plug on the idea in the latter half of 1997. Main article: NetLink Internet Modem/Magazine articles. The Sega Saturn NetLink League -- Hook up with fellow NetLink users to play Saturn games online!